NOTE: As mentioned in a recent post, the comments function of my blog no longer works. I tried to get the problem sorted out before going on the road, but to no avail. I finally resorted to setting up a new blog at another URL. It contains all of the posts that reside at this URL, but also has all of the missing comments and allows new comments to be posted. You can find the new blog location here. I’ll try to remember to put up new posts here, but I suggest updating your bookmark to the new URL. 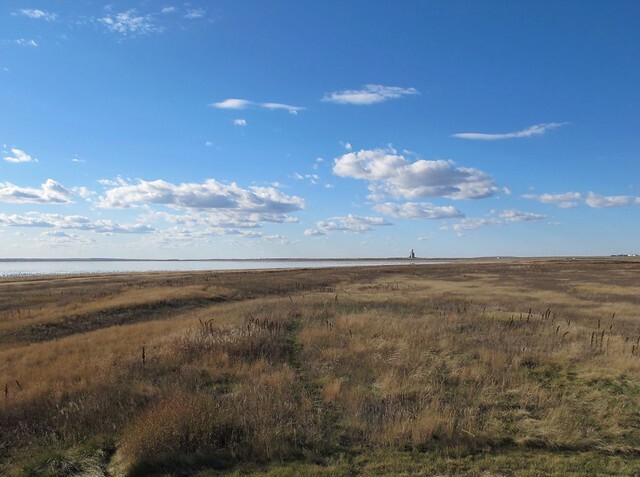 At 10,000 acres Reed Lake is one of several large, shallow, saline lakes along the TransCanada highway, between Chaplin and Swift Current, Saskatchewan. 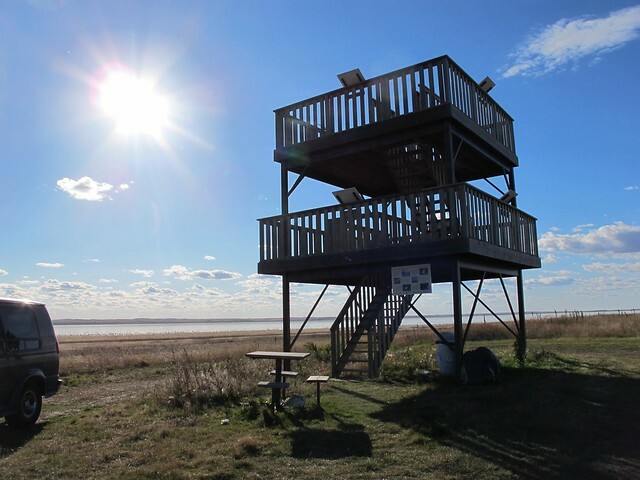 It is an important resting and feeding place for migrating birds that spend summer on the Prairies or further north in the Arctic. 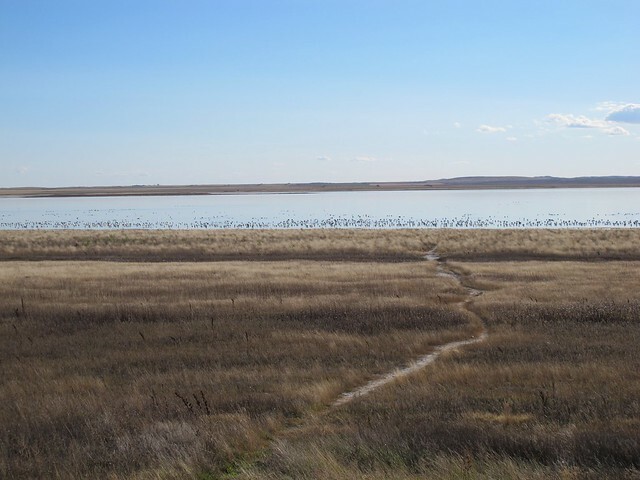 During my round trip crossings of the Prairies each spring and autumn, I have stopped at Reed Lake hoping to catch the migration of Snow Geese, Tundra Swans and other water and shorebirds. Each time, I was either a little early or late, or the weather had been unusually cold and the lake was iced over. However, on this crossing, I was fortunate to be passing by in the late afternoon on a day when there were many birds down for the night. I stopped, mainly to rest, as I had driven through from Brandon on my way to Swift Current. Although I had packed my field scope, i was feeling a little too weary to drag it out. Instead, I took my binoculars and climbed the stairs of the observation platform. There was a well-trodden path to the water’s edge, but with the birds looking peacefully settled in for the night, I did not wish to approach too closely and stayed well back from their comfort zone. That was close enough to watch the gathered flocks swim, feed and socialize. 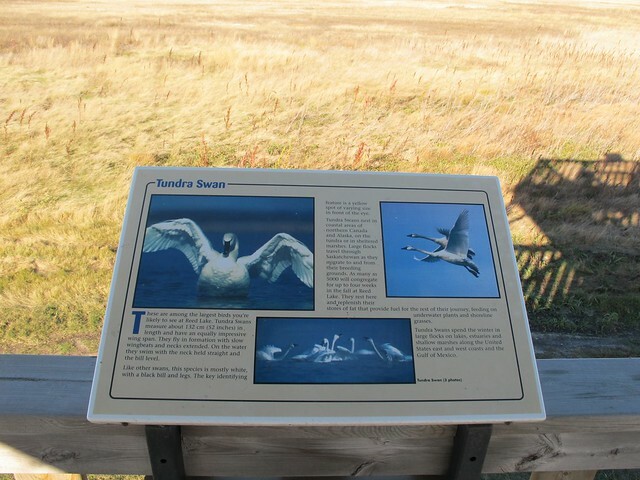 Most were Snow Geese, but there were a few dozen of what must have been Tundra Swans, judging by their very straight necks. Periodically, I could see dense flocks of smaller birds rising up and flying like a wave over the shallows on the far (south) side of the lake. Unfortunately, the distance was just too great for my eyes and binoculars, so I could not identify them beyond saying that they were shorebirds of some kind. The camera gear I use is mainly for macro photography, so my photos just give an impression of the place. You will have to imagine the great gathering of birds for yourselves. What I enjoy almost more than watching large gatherings of birds is listening to them when the are down and feeding. There is a loud but peaceful quality to the tumult of voices. I’ve heard it with the Sandhill Cranes at Whitewater Draw in southeast Arizona where they (and I) overwintering. Also with the Western Grebes in the Malheur Refuge of south-central Oregon, and the Ibis, Egrets, White Pelicans and many others at Tule Lake in northern California. It is such a joyful, soothing sound. One to which I could listen for many hours. After a break, I drove the last stretch on to Swift Current to spend the night at a motel. Last year, While in that area, I camped at Grasslands National Park and Buffalo Pound Provincial Park, but was several weeks earlier in the season. Being later, this trip has been a little different as I am having to pay more attention to the weather. Fortunately, this has been an unusually warm, dry autumn, but as the days march on, I realize that it would be foolish to plan the remainder of the trip depending on luck.